I went to MLK high school this afternoon to help collect baseball and girls soccer fees and paperwork. MLK is one of the schools that I work with, and because of the weather, they have been awesome and have reserved their two gyms for us for the week. I don’t go to this school very much because it’s not our “home” school, I guess you could say. But I really should go over more because it’s quite nice. 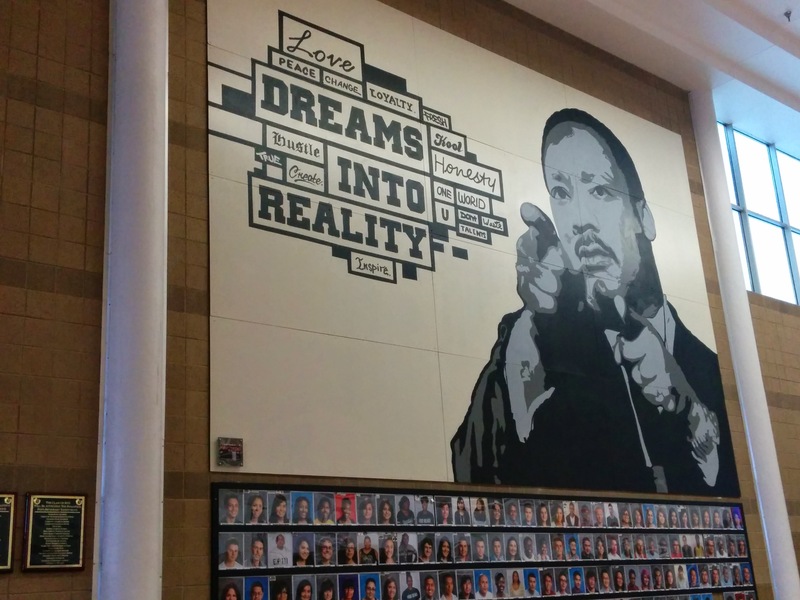 This is where my picture comes in, there is a huge mural of Martin Luther King on the wall right when you walk in. And underneath are pictures of every senior that year. It’s quite inspiring really. So I stayed until 6:30 taking money and paperwork and then headed home in the snowy world that is Colorado right now. I was thinking as I was driving home, that I’m not nearly as stressed driving in bad weather as I was last year. I think it’s the new tires I got. I’m not quite sure what percentage of my improved confidence is the actual tires or my mind thinking that because I have new tires, my car will do better in the snow. Either way, I haven’t had any major slipping like I did last year, so I am thankful for that. When I got home I walked around outside with Pippin for a bit. The poor guy has been stuck inside for the past three days straight, so he was going a bit stir crazy. I play with him, but it’s never enough. Since he was willing to go outside this evening I went with him to see if there were any good picture opportunities. While out there, Pippin decided that he was done following me in the snow, the part that I had crossed was too deep, so he jumped up onto a nearby tree. Yeah. He just clung to the tree for a few seconds, looking around to see where he could go, decided there was nowhere to go, and dropped down again. It was funny. I took a picture, but it didn’t turn out well. My phone’s camera isn’t great in the dark. You’ll just have to take my word on it. He’s finding that he likes being outdoors more than he dislikes the snow. Granted, he still doesn’t like it, but he’d rather be out there than inside. At least for a few minutes. Great blog! Could your newly found confidence in driving in snow also be attributed to experience, and maturing? Yep, my baby girl is now an adult – who drives (carefully and slowly, I’m sure) in the snow. So proud of that one!